Live at Loreley is a 2001 DVD release based on the German TV broadcast of The Band's concert at the Rockpalast Festival, Loreley, St. Goarshausen, Germany, 23.06.1996. In 1996 the Band played the festival at Loreley on the Rhine at the end of a short European tour, starting in the Netherlands, then going on to England and Ireland. German TV captured them on the 23rd June 1996, and the resulting DVD comes near the very end of the 1990s six-piece 'new Band'. They did a few gigs after this in the USA, but this was near the end of a long road. The tour was in support of their second 1990s album High on The Hog. At Cambridge Corn Exchange on the 19th June they'd been in excellent form, though it was said that Rick Danko was ill. He seemed less involved than the others, and the show was enriched by members of Four Men & A Dog for the encore. This may have been normal, but the afternoon soundcheck was only done by the three "new" guys, Jim Weider on guitar, Randy Ciarlante on drums and Richard Bell on keyboards. The three original members didn't show for it. On the 20th they were due to play the Forum in London, a prestige gig drawing the British rock press, who had been noticeably absent at Cambridge. The adverts for the Forum had proclaimed "only British appearance" which hadn't helped. On the way down, they dropped into London's GLR Radio for a live recording in the basement studio. It's an unplugged line-up (making you wonder why they never did an Unplugged show), and they do a good Don't Ya Tell Henry. This may be the influence of being back in a basement, but they seemed intent on lurching into another one right away. The DJ firmly says he's going to play something from High on The Hog and plays Stand Up. They then do Crazy Mama live which is quite hypnotic, with prominent bass, presumably from Levon as on live performances. Richard Bell holds it all together with superb piano. The DJ asks them to do Back to Memphis and Rick introduces The Band with Levon calling out incoherently in the background. The introduction becomes so rambling with long lists of Garth's houses (Garth protests that he's moved from one and sold another) that the DJ interferes to finish it quickly, but Rick ploughs on regardless. Levon is obviously well out of it in some way, and he drawls 'Let's shoot the breeze', the DJ snaps 'This is live radio, do you want to play the song or not?' Levon keeps shooting the breeze. The DJ cuts them off and says 'Mr Helm elected to shoot the breeze. Some of us are on London time and some of us are on Woodstock time. The two don't quite synchronize.' And they're off. No third song. In their defence, this was the DJ who'd talked all the way through their televised Woodstock 94 set, and they had been informed of that the night before. And so to the Forum in London. The show was enlivened by a totally drunken John Martyn lurching around during Ophelia This is the gig bitterly criticised by Peter Doggett in Record Collector, August 1996 for Danko's lacklustre performance - yawning, sitting down on the amp, and finally failing to appear for the encores. 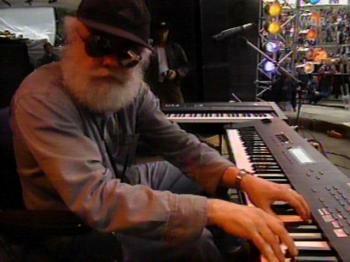 Doggett also says Garth Hudson was inaudible on keyboards and only drew squeaks from his horns. 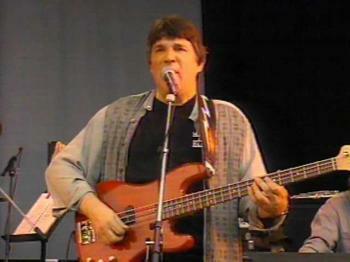 Peter Doggett has shown long term enthusiasm for The Band, and always reviewed them warmly. His conclusions were damning. The rest of the rock press seemingly had reporters there, who chose not to file their reviews. One, I was told, declined to report out of respect for their memory. On the 21st they played Dublin, and the tour was dissolving into low farce. For whatever reason, Rick Danko was in serious trouble on this tour. He lurched off the stage after six numbers, not to return. Levon Helm smashed his mandolin into the wall and fell into the drums. Levon ended by saying how glad they were to be back in London, which is undiplomatic anywhere, but more so in the capital of the Republic. After Rick left they struggled on manfully, even doing Sweet Home Chicago which is a common enough resort for a band that doesn't know what to do next. Randy Ciarlante and Richard Bell, who never normally sings, both sang on choruses. On the 22nd they played Dublin again. I haven't heard a tape of this one, but all reports are that they were back on good form, Rick Danko was fine and I was told it was as least as good as Cambridge. 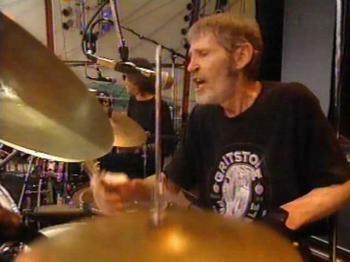 Levon Helm and Randy Ciarlante, Loreley, 1996. 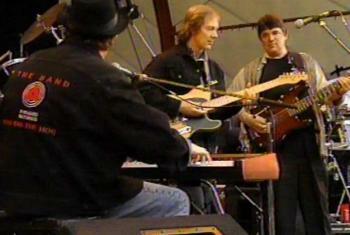 Richard Bell, Jim Weider and Rick Danko, Loreley, 1996. The 23rd June. Just a day later. I've had an audio CDR of this show for a couple of years, taken from the TV broadcast, so the versions are familiar. The DVD is crystal sharp in picture quality, and sound is good. The stereo mix sounds better than the post-production imposition of 5.1 sound, but that's common. As so often in 5.1. the bass guitar virtually has its own speaker and can over-dominate the mix. On this particular day, that was not a good thing. Record company involvment is pretty apparent. 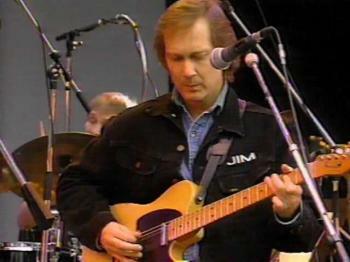 Jim Weider, Richard Bell and Levon Helm are sporting matching black Levi jackets, with their names embroidered on the front and "Pyramid Records: High on the Hog" on the back. Garth seems to have the same jacket without the logos. Randy is wearing a black T-shirt while Rick Danko has a loose shirt over a T-shirt, but at least four of them appear to be wearing band uniforms, perhaps for the first time since the days of Levon & The Hawks. The setting is cold. They're playing on a stone stage in a band shell, with the curved area in front of the stage kept totally empty for cameras. The crowd are at least fifty yards back from this, leaving them isolated on a grey afternoon. Watching the DVD was a strange experience, because the pictures, and especially the body language of all of them, strongly distract from the listening pleasure. These are not guys having fun. It's all summed up in an expression of guitarist Jim Weider's, caught just as Rick Danko starts a song. It's full of utter suspicion and wariness. It says 'Is he going to get through it?' Richard Bell is possibly the outstanding instrumentalist on the day, but does not show one spark of pleasure, enthusiasm or interest in his face. Dark glasses don't help. Garth Hudson is isolated, face covered by his hat, lost in the keyboards, never looking up. Randy Ciarlante is working hard, again expression concealed by sunglasses. Jim Weider looks deep in concentration and worried. On the audio, you hear that he's on sparkling form on the day, but his face belies that. Rick Danko is standing there like a lumpen statue. None of his cheerfulness, or exuberance appears at all during the show. This is a man labouring to get through. He only sings lead on four numbers out of fifteen, and the rest look worried while he's doing them. The reason that 5.1 doesn't help is that his bass playing is unnaturally leaden, muffled and plodding. This is emphasized when Levon plays bass on Crazy Mama and immediately gets a crunchier tone, and hits a groove that has been eluding Rick Danko all afternoon. Levon's voice sounds tired, he sounds wrecked, but his sheer spirit shines through, as if he's holding the show (and the Band) together by the pure force of his willpower, which I think he might have been. I've had the same thought watching them before. The right way to have staged them was to put Levon on a great big drum riser at the front centre, put a spotlight full on his face, and stuck a broom handle up the back of his shirt to stop his habit of crouching so low that he gets hidden behind the cymbals. All the way through the show, it's Levon (closely followed by Randy Ciarlante) who shows all the enthusiasm, drive and spirit. That's what the audience wants to see. Fortunately the camera returns to Levon and Randy a lot. 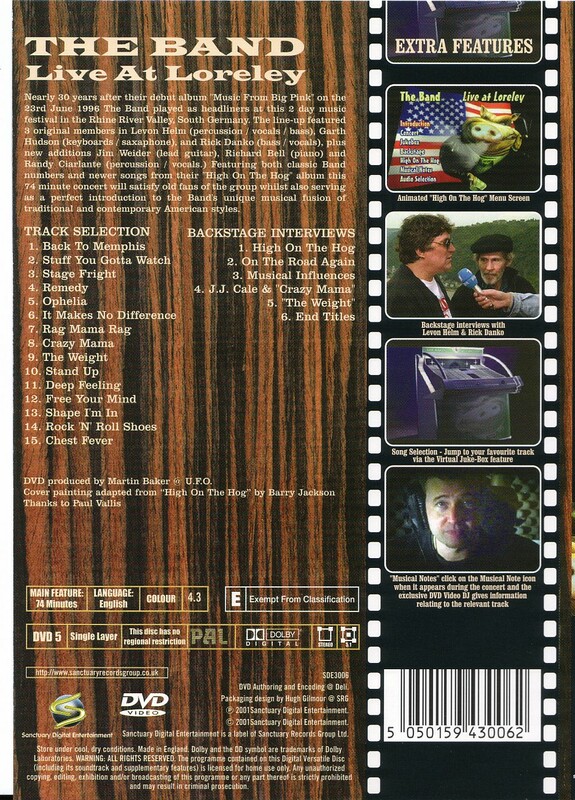 The DVD has a 'video jukebox' track selection feature that works well, but it also means a blank screen is inserted between songs, and then each song starts tantalizingly a note or two in. As this was being broadcast, versions are shorter than normal, and on the audio CDR there is only a few seconds of audience noise (Levon! Garth! Aargh! Levon! etc) between songs. The DVD would have run better with this left in. Camera work is usually tight, always clear. It's not until the second half that the director decides to show flashes of the audience, returning again and again to the same statuesque blonde, perhaps in hope of exciting visual activity, that isn't rewarded. Old German male hippies have very long hair too. A tighter camera would have captured a better ambience. Those cold grey crazy-paved steps are not cinematically interesting. It's the Levon Helm show. The numbers from Jericho where the voices blend or exchange lines, Springsteen's Atlantic City and Bob Dylan's Blind Willie McTell which were the centrepieces of the stage act for the previous five years are noticeable by their absence. They'd done both well at Cambridge a few days earlier. 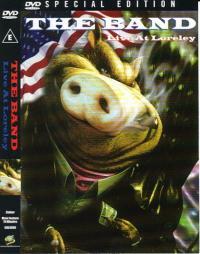 They start out with Back to Memphis, from High on the Hog. Confusingly, their 70s shows had often started with Chuck Berry's song of the same name. This is the different Johnnie Johnson and the Kentucky Headhunters song which invariably opened their 1996 shows. They used this one to establish a groove and it was loose, ragged, lurching and quite wonderful as it all came together on most shows. On this show, it's a shorter, neater version with Garth's sax and Richard Bell's piano work creating all the interest. Second up is Stuff you Gotta Watch, with Levon still on lead vocals. The brass section is synthesized off a keyboard. As in Cambridge, they seem to have a stripped down set of equipment for this tour, with Garth content to synthesize most of the brass parts, and playing less saxophone than in the 1994 concerts. On many concerts, there's a thrill as Rick takes his first lead vocal. That Canadian sound, that beautiful voice actually shouts to me 'this is the Band'. His first song is Stage Fright and his voice sounds weak, his bass playing muddy. The shriek of mics feeding back throughout suggest either a lack of soundchecking, or more likely that the sound engineer is trying to boost volume to compensate for lack of vocal power. Remedy seems to be a case of keep your heads down and boogie, and Rick Danko has the bored expression that was apparent on the preceding British gigs as he plucks out the bass line with none of his normal fluid bouncy feel. Ophelia is Levon on lead for the fourth number out of the first five. Jim Weider looks strained. Richard Bell looks bored. Rick Danko's first smile of the show is reserved as a tribute to Garth's sax solo. Whenever and wherever he sang it, It Makes No Difference is something Rick Danko could pull out all the stops for. The mic feedback suddenly appears again, as if they're trying to squeeze an extra bit of volume from the vocal mic. Rick never did this song badly. He didn't here, but there's a lack of power. Rag Mama Rag follows, and you have to wonder why Levon stayed at the drums to play mandolin. He's hidden from view, and admittedly he's playing hi-hat with his foot, but there's no need for that with a drummer as excellent as Randy Ciarlante alongside. This was a case for getting up and walking to the front of the stage, especially as he was due to play bass guitar on the next song. Maybe it was to do with camera positioning. The song should be ragged, but here it's just messy, one of their worst renditions of the song. J.J. Cale's Crazy Mama is not my favourite song, and I've never understood their strong loyalty to it. In the interview section of the DVD, Rick says that J.J. Cale was an old friend, and Levon adds that he and Leon Russell had the best groups in the Tulsa area. Levon moved to bass, twiddled the knobs and got a crunchier sound as well as establishing a great hypnotic groove. Rick Danko strummed acoustic (near inaudibly) and put thesong across well. It's an excellent version, probably because it's shorter than usual, and tired as he looked, Rick could take the lazy vocal with ease. They seem to cross a threshold with the song, as if they're at last warmed up and ready for action. Which is just as well, as The Weight follows. This is excellent, and as good as they play all afternoon. Richard Bell takes the piano part, with Garth adding organ. In the classic pre-1976 days, Garth used to switch to piano for this with Richard Manuel moving to organ. They don't bother to switch anymore, and Richard Bell does a great job on piano. Stand Up is tight and sassy. Levon on lead vocals yet again. The brass sound is keyboard generated again, but this is a High on the Hog number that they could perform brilliantly live, and they do here. Chuck Berry's instrumental Deep Feeling was always Jim Weider's showpiece, and was played most nights on 1990s Band shows. It's suprising then that this is the first officially released version by The Band, though a solo version can be found on Big Foot by Jim Weider and The Honky-Tonk Gurus. In an interview Levon Helm says the first record he bought himself was Chuck Berry's Schooldays, and this was the B- side. It gives Weider ample opportunity to demonstrate his Telecaster mastery and features very fine solos from both Garth Hudson and Richard Bell. Outstanding. En Vogue's hit Free Your Mind was the surprise track on High on the Hog. In the interview section, Levon describes it as 'a good ol' American song'. The lyrics about looking like a prostitute, wearing hip-hop clothes and liking rap music always sat oddly with his voice. I've heard other live versions from 1996, which frankly I'd describe as misguided bordering on disastrous. This might be the best live version they did, again because they kept it short and tight, but it's still mechanically tedious for musicians of this stature and doesn't suit their style. The German audience seemed to love it, and the camera cuts to them singing along raucously and cheerfully. In contrast to Rick Danko. The Shape I'm In is Rick's fourth and last lead vocal of the show. The words are all too appropriate. Again Jim Weider almost seems to groan as Rick sings the chorus. Bell is on auto-pilot. Then the camera switches to Levon who is singing his heart out in support, trying desperately to lift his friend's vocal. Rock & Roll Shoes demonstrates why Levon and Randy needed to be up front on stage. Both are still putting their all into the song while the other four look either sullen, bored or just doing a job. This says it all about the show. I don't think I'm gonna last very much longer... No one realized it at the time, but the Band indeed weren't going to last very much longer. They played a few shows in the USA in August 1996. after that, there are just a tiny number of isolated gigs, often with guests to boost them. Danko's incarceration in Japan on drugs charges the next year had finished off their tour plans for the summer, and lost them both money and credibility. Their final album, Jubilation in 1998 was a change of direction, and one that could have given them new mileage, but it was laden with guest musicians. Richard Bell was hardly present. Danko sang like a bird, but didn't play enough bass. Levon's voice was shot, and he was undergoing treatment which resulted in him being advised not to sing again. Their last gig as The Band was probably at Levon's club in New Orleans, enlisting supporting musicians to help them through. The club went bankrupt. Then Rick Danko died in December 1999. All three voices of The Band, Richard Manuel, Rick Danko and Levon Helm, had been stilled. Something happened. Looking back, I'm sure something snapped on that tour. Maybe it was mutual trust in each other's reliability. Rick Danko seemed to prefer his more melodic solo gigs and didn't look content at Levon's love of easy rock and bluesy numbers. His songwriting efforts in the 1990s had been channeled into his work with Danko, Fjeld, Andersen. Garth Hudson, as his recent breathtaking solo album Sea to the North indicates, was criminally under-employed in the last year or two of The Band. Richard Bell seemed to be there for the session. I spoke to a promoter a year or two later and mentioned that it would be great to see The Band in England again. He told me that the word was out after The Forum in London, and Dublin. They were "unreliable." All is not over. Rick Danko's posthumous Times Like These remains as a wonderful legacy of that voice. Garth Hudson (with the aid of The Crowmatix) has played inspirational solo shows and apart from Robbie Robertson has produced the best post- Last Waltz album by any of The Band in The Sea to the North. Levon Helm is, as usual, playing his heart out with the blues-based Levon Helm and The Barnburners in the clubs (with an album hoped for by all who've seen them). Jim Weider and Randy Ciarlante now form the heart of The Honky-Tonk Gurus. Live at Loreley is ultimately a sad testament to the Band in its 1990s version. It's not their best performance by a mile, and perhaps my favourite singer of all time, Rick Danko, is clearly unwell, way off-form. Levon was up for it, and this minor, late and disappointing work by The Band will still beat anything most groups will ever do in their lifetimes.